This week's challenge called for a Midas touch. The only rule, use gold. It could be glitter, gold leaf, paint, beads... just make it gold. Inspiration struck while I was reading movie reviews, The Oscar statues are gold. 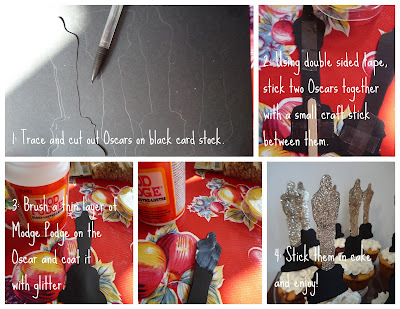 I could craft something Oscar related. After a little bit of sketching and an assessment of available supplies, I came up with Oscar cupcake toppers.